The alarm woke me up at 6:00am. It was a relatively cold morning: +12C inside my tent, +9C outside. Moved to the cooking area, started working on my breakfast: oatmeal and coffee. The sun was rising, covering the cove in beautiful morning colours. I had rushed to the tent and grabbed my walk-around camera to capture the moment: the camera was dead! It would not exhibit any signs of life, and replacing the battery with a fresh one did not help. Worst of all, I could not explain what had happened to the camera. This was a consumer-level DSLR with video capabilities. On my previous expeditions, I had used two professional DSLRs (rugged, with extra weather sealing) complemented with a water-proof point and shoot camera for especially wet days. This time, I had taken with me one full frame professional DSLR and this consumer-level video-capable DSLR that I was planning to use it extensively to film my expedition. I also had with me the usual water-proof point & shoot and a very old six-megapixel consumer-level DSLR as a backup. Never before had my cameras decided to go belly up, and while I was taking proper care of them, I had also photographed in harsh conditions, including in moderate rains. With this, almost new camera, I had not photographed in a rain, only in a light drizzle a couple of days before, and for a very limited time. Although I was photographing while kayaking, it did not get wet on any occasion. I had not dropped this camera, but then I immediately remembered that a night before it had rolled down from my knee along my leg and on a soft ground. Maybe that was the cause of the troubles? Some time later, after all my attempts to revive the camera had failed, I had no choice but to pack it up, all hatches open, in a plastic bag with a silica gel package inside. I had decided to give it a day in a dry environment, in case this was a temporary moisture-induced problem, and then try again. Meanwhile, I had to move on to my backup: the six-megapixel DSLR that I had taken on this trip just in case, never expecting to have a need for it. While I also had with me my main, full frame professional DSLR, I did not want to use it while kayaking without knowing first what had happened to other camera, preferring to keep it for shooting in more controlled conditions. By this time the beautiful morning light was gone. Returning back to the cooking area, I had finally cooked and quickly consumed my by now late breakfast, broke the camp and started moving my dry bags to the shore. 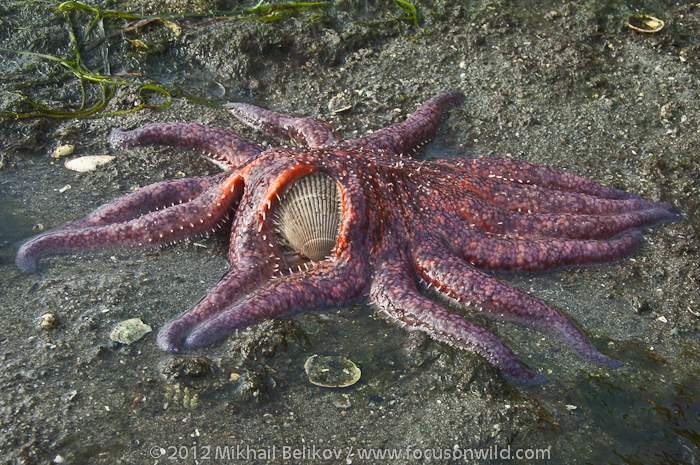 While going back and forth, I had discovered in the tidal area a sea star in a process of sucking out a clam. Sea stars consume clams by opening them up and then injecting their stomachs inside. Clam's soft tissues then would be gradually dissolved with stomach juices. After all the delays, I was running late. While the early morning was calm, the wind had now started picking up, threatening to build up the seas in the open areas. I had to finish loading up my kayak at an expedited pace. Once out of the protected cove, I had to paddle against a persistent wind and waves. It was a sunny day with the sun and its reflections in water almost blinding, despite wearing sun glasses. After an hour of intense but slow paddling against the wind and the waves, I had stopped in a tiny bay partially shielded from the weather, put on some sunscreen and helped myself to a couple of granola bars with water: my lunch. Back in the passage, the further build up in the seas was quite noticeable, and I began thinking about my plan B. If the waves in the open area ahead were too high, I would have to find a protected place to camp close to the passage entrance. 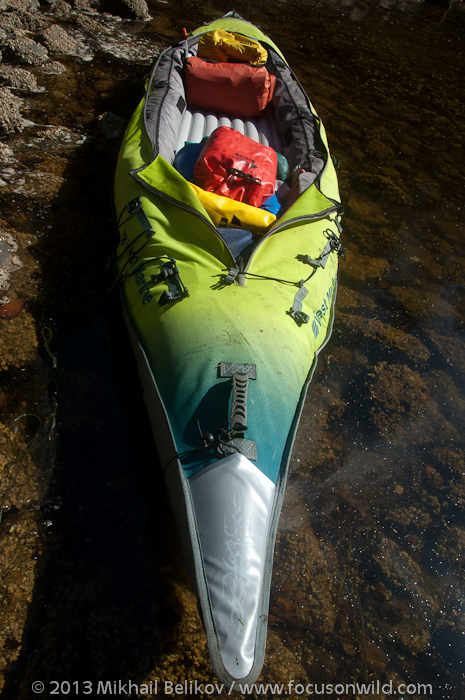 While paddling, I was noticing all promising bays, gently sloped rocks and other spots where I could haul out if needed to be, without returning back to my last camp. Fortunately, the wind had subsided a bit, just enough to cross the open area with no issues: the side waves, while quite sizable, were manageable. The open stretch was less than one km long, and soon I was already hiding in the shadow of Milne Island, with waters almost calm. By the time I had reached the narrow area in Thistle Passage, between Princess Royal and Hastings Islands, it was already a late afternoon, and tide had turned to ebb. However, the counter-flow was still slow, and I had passed through without a fight. Finally, I was inside Laredo Inlet! Slowing down for a quick rest, I photographed an island with a cloud hanging above it, resembling a halo above saint's head. I had called it a Saint Island. It was around 7:00pm when I had entered Quigley Cove. Salmon was jumping all around me; however, this area was off-limits for fishing, and so I had to continue relying on my on-board food supplies. Pitched the tent, made a dinner of instant mashed potatoes with a small can of ham, followed by a cup of rooibos tea and a few dates. In bed by 10:30pm, updating my expedition diary and listening to a VHF forecast: a weak system approaching, some rain expected tomorrow ending in the evening. This was confirming my own earlier observations: sun partially disappearing in veil-like clouds, a few stars showing up and then quickly gone, as the clouds had covered the sky. The night was relatively warm, with lots of dew. Decided to stay for at least a day. It was not fun packing up and paddling in rain. 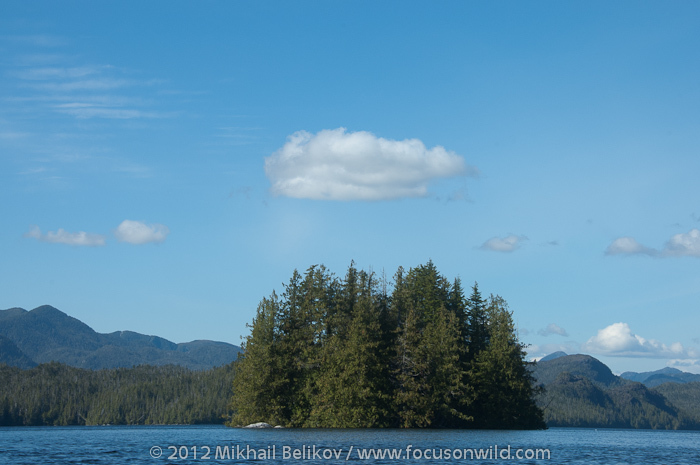 Besides, I was inside Laredo Inlet and it was a good opportunity to start searching for signs of a spirit bear.